You need exposure to high-yield cases to excel on the family medicine clerkship and the shelf-exam. 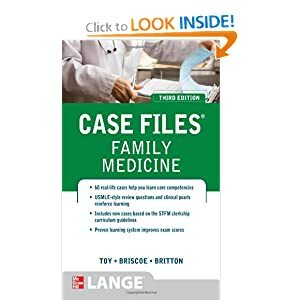 Case Files: Family Medicine presents sixty real-life cases that illustrate essential concepts. Each case includes complete discussion, clinical pearls, references, definitions of key terms, and USMLE-style review questions with detailed explanations of the correct answers. With this system, you'll learn in the context of real patients, rather than merely memorize facts.